Need a small office shredder? Destroyit brands are tough, long lasting and high performance shredders! Small home offices or home base business can rely Destroyit shredders to out-perform store bought counterparts. These compact and light-weight small office equipment are built to exacting standards. The cutting shafts are solid steel and outlast "blade type" designs which you find in lower end equipment. The higher business class models are also manufactured using durable Solid Wood laminated cabinets - and won't break or fail with heavy use. 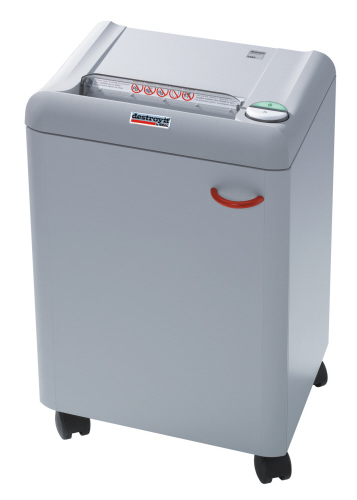 These Destroyit shredder models come in both Cross Cut and Strip cut shred formats. 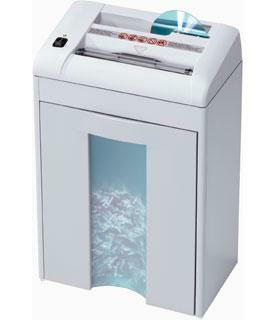 The Destroyit 2270cc is a multimedia and paper shredder which can be used under or at desk side. There are two insert slots, one for paper on for multimedia data disks like CD's or DVD's. This model is ideal for the small home office. There are two separate collection bins - one for paper one for shredded disks, and can easily be emptied by removing the head unit. The front waste bin window allows you to see when it's time to empty the main bin. Destroyit 2270s Strip Cut desk side model paper shredders put effective paper and multimedia shredding security right at your desk side. The cutting shafts for these Destroyit machines have a lifetime warranty are the 2270s is more powerful and durable than off-the-shelf shredders from office superstores. The Destroyit 2360 SMC (Super Micro Cut / Cross Cut) is a Government Approved Shredder with a Type II / Level 6 security shred rating. This model exceeds the RCMP Secret / Top Secret requirements rating in shred size. The Destroyit 2360SMC also includes the SPS (Safety Protection System) and ESM (Energy Savings Mode) which is now standard on Ideal-MBM models. 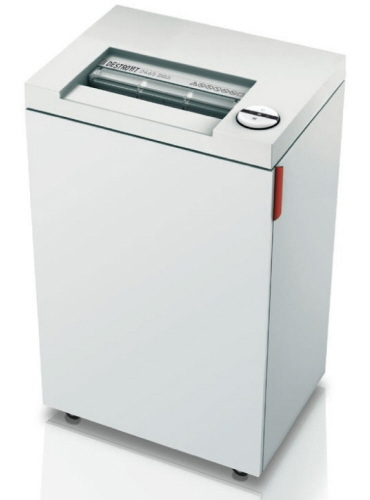 Destroyit 2360cc Cross Cut desk side model paper shredder is designed for offices with 1 to 3 people where shredding 100 to 500 sheets per day is required. Available in both models are capable of destroying smart cards, credit / debit cards. With a strong 1/2 horse power motor, solid cutting shafts with a lifetime warranty - you can expect this shredder to outlast any other store bought model on market you may have used in the past for your small home office. The Destroyit 2465cc is a larger capacity desk side office paper shredder with credit card / smart card destruction capabilities.